Warrants to the original purchaser that it will repair or replace, without charge for parts or labour, any defects in materials or workmanship for a period of two years, when used as intended and under normal service conditions. This warranty is limited to the replacement of any defective part by Ben Wye Engineering & Design and the installation by an Authorised Dealer. Misused or damaged by accident or by lack of normal maintenance or care. Repaired in a way that adversely affects its performance or reliability. Used for a purpose for which the product is not designed will not be covered by this warranty. Failure to properly maintain oil levels, grease points, and PTO shafts is classed as misuse. Down time or other consequential damages. Delivery of the product or part will be at the owner’s expense to the original place of purchase. Any penalty rates or travel time shall be at the owner’s expense. 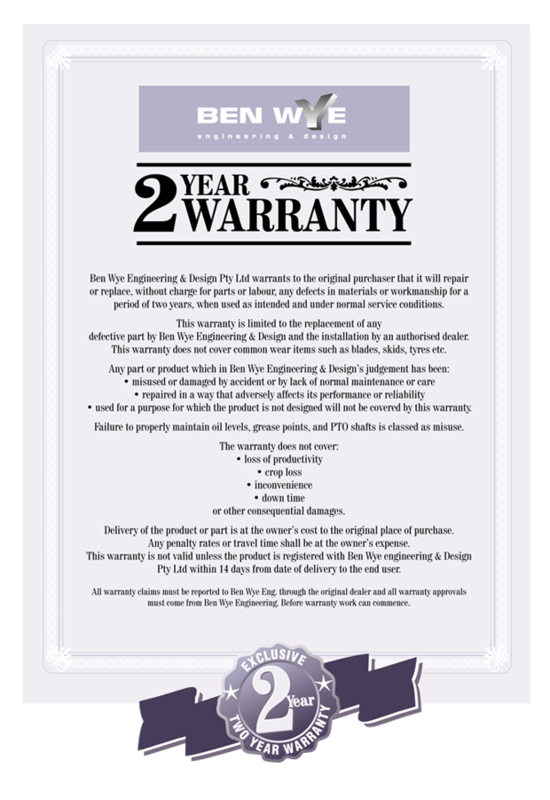 This warranty is not valid unless the product is registered with Ben Wye Engineering & Design Pty Ltd within 14 days from the date of delivery to the end user. All warranty claims must be reported to Ben Wye Engineering Pty Ltd through the original dealer and all Warranty Approvals must come from Ben Wye Engineering Pty Ltd before Warranty work can commence.